The Ladbrokes Caulfield Guineas is the premier classic mile race for three-year-olds in Victoria held at Caulfield Racecourse in mid-October each Melbourne Spring Racing Carnival. The Ladbrokes Caulfield Guineas is a Group 1 race for three-year-olds held in mid-October during the Melbourne Spring Racing Carnival. 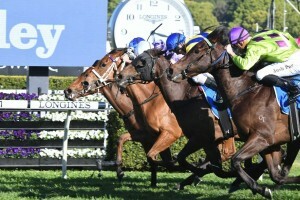 Offering $2 million in prize money, the 1600m race attracts the best young milers and promising staying types of the season. The race is featured on a massive day of Group 1 racing alongside the Toorak Handicap (1600m), Caulfield Stakes (2000m) and Thousand Guineas (1600m) for the fillies. As a set weights race, colts and geldings are required to carry 55.5kg while fillies must carry 53.5kg. The Caulfield Guineas is regarded as a good lead-up race to the Group 1 Cox Plate (2040m) at Moonee Valley and the last Guineas graduate to back-up and win the weight-for-age classic was Shamus Award (3rd) in 2013. The latest edition of the Ladbrokes Caulfield Guineas took place on Saturday 13 October , 2018. See below for the official Ladbrokes Caulfield Guineas 2018 Results & Finishing Order upon the immediate conclusion of the race. The latest Caulfield Guineas 2018 betting markets for the three-year-olds facing off in the marquee race of Caulfield Guineas Day will be found below complete with links to the Caulfield Guineas odds at Ladbrokes.com.au as soon as available. In the 10 years from 2007 – 2016 the Caulfield Guineas favourites enjoyed a solid strike rate including the win by Press Statement (2015), a good tip to consider when dong the 2018 Ladbrokes Caulfield Guineas form. Each year the Caulfield Guineas field attracts a smart line-up of three-year-olds, with colts and geldings dominating the line-up as the fillies tend to stick to their own kind in the Group 1 Thousand Guineas (1600m) at the same meeting. Good lead-up races for gallopers heading into the Caulfield Guineas field include Sydney’s Group 2 Stan Fox Stakes, which produced all three winners from 2014-16, and the Group 3 Caulfield Guineas Prelude (1400m) run a fortnight before the Group 1. The 2018 Caulfield Guineas field of final acceptances and barrier draw are released by Racing Victoria on October 9, 2018 so stay tuned. The Ladbrokes Caulfield Guineas nominations are taken in early August and featured 98 hopefuls including Chris Waller’s Group 1 Golden Rose Stakes winner The Autumn Sun and runner-up Zousain. The Caulfield Guineas First Acceptances narrow down the list of potential three-year-old’s heading into the $2 million mile feature and are taken in mid-September each Melbourne Spring Racing Carnival. First run in 1881 when Wheatear won, the Caulfield Guineas was run at Flemington Racecourse briefly between 1940 and 1943. The Caulfield Guineas traditionally occupies the second Saturday in October and is the first day in the Caulfield Cup Carnival. Several renowned Australian Racing Hall of Fame inductees have won or placed in the race throughout the years including Lonhro, Tulloch and Ajax. Caulfield Guineas results and winning times since 2000 are listed below.